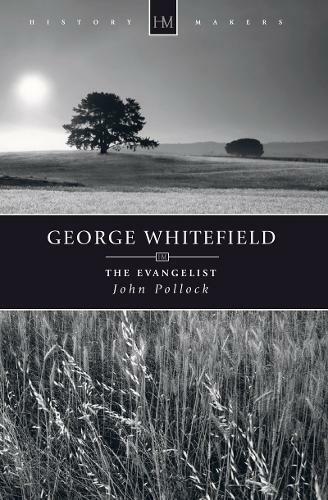 John Pollock vividly portrays George Whitefield and his times - George's long search for peace with God, his joy at being forgiven and justified through Christ's atoning death and then his enthusiastic sharing of the Gospel. Often facing misunderstanding and even opposition from the established Church, he started to preach in the open air, beginning among the mining community and those who normally wouldn't come into Church. The story is told of how God worked in a remarkable way through George in Britain and also in the Colonies of America. Travelling many miles by horseback, crossing the Atlantic on countless occasions, sometimes experiencing illness and fatigue, countless people were drawn to Christ through this man - the "Billy Graham" of his time. Come and catch the drama and also the passion and commitment George Whitefield had for the Gospel. "May the rising generation catch a spark of that flame which shone with shuch distinguished lustre in the spirit abd practice of ths faithful servant of the most high God." "George Whitefield was a courageous, pioneering evangelist who defied the prejudices and constraints of his day. Whilst he was no saint, he preached the gospel in places where others feared to tread. John Pollock's biography is highly readable and succeeds in bringing to life the man and his amazing ministry. I hope it will inspire the next generation of preachers and evangelists who have heard God's call."